AnnaLaura Campbell is a Junior from Bailey, MS, majoring in Accounting and minoring in Religious Studies. After graduation, she plans to attend law school and study business law or continue her education in Accounting with a master’s degree and CPA license. We’ve heard the phrase many times in our lives: “That’s like comparing apples and oranges!” But what does it actually mean? Apples and oranges are both fruits, relatively circular, and a healthy snack, but they are distinctly different from each other when it comes to color, taste, and texture. We often use this phrase to reference the comparison of two separate entities that are seemingly similar to each other, but inherently different. We don’t just apply this idea to fruit, though; we compare people in the same way. One of the main themes in our “Tales from Asia” class has been comparison. How we compare things and why we compare them are two very important aspects of our studies. As a class, we employed this idea of comparison while analyzing the ancient Indian epic The Ramayana. This is a tale of family, love, tough decisions, and doing what is best for the nation’s people. I had a chance to read a couple comic books about the characters from The Ramayana, and I found it very easy to begin comparing two particular characters to each other. Dasharatha was the king of Ayodhya and his son Rama, after much trial and tribulation, later was crowned king as well. Because of their equivalent significance in society and obvious family relation, it became easy to assume that these characters were the same and to compare them as if they were, but should it have been? When analyzing these comic books, I focused on the specific decisions that both of these characters made. Even though these decisions themselves were different, there were some similarities between the two. Both decisions affected the family dynamics of those involved, were very emotional, and were made in order to please the people of Ayodhya. These similarities, though, gave way to the larger contrasts between the two. Dasharatha, the orange, was a seasoned king facing the idea of losing his beloved son for 14 years in order to keep his promises that he had made to his wife many years prior. In the end, he did end up banishing his son in order to show that he was an honorable king and husband who kept his word. Rama, the apple, was new to the throne and was trying to do what his people would think is best when he had to make the decision of whether to banish his wife or not. After some thought, he decided that his duty was to his people, not his wife. The situations that caused these decisions to be made are also quite different. Since these two characters are different people set in a different time with different motives, it would be inaccurate to make a direct comparison between the two. There are too many contradictions between Dasharatha and Rama to lump them together and say they are the same. When I compared the two as the same, the story became skewed and didn’t give an accurate representation of what was going on in either Dasharatha’s or Rama’s Ayodhya because I ignored these differences. Just as I did in my analysis of The Ramayana, people often try to make comparisons out of two separate entities to try and make some sense of them. 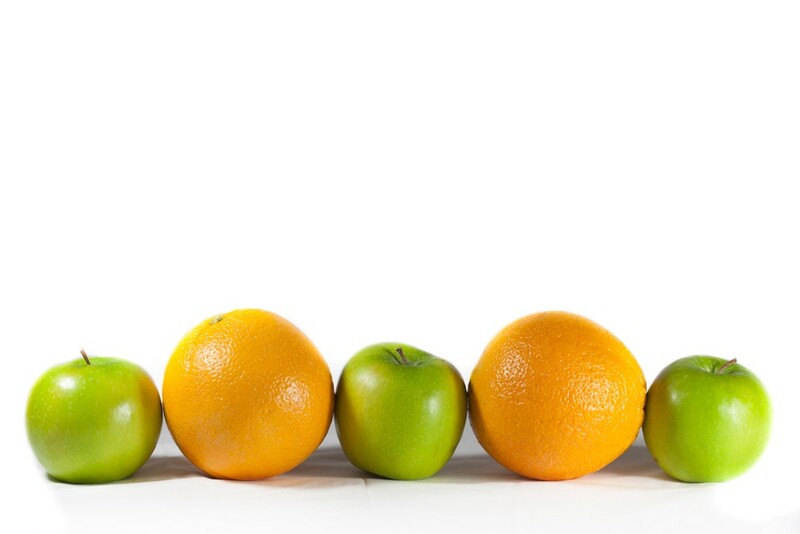 So, next time you are in a situation where you begin to employ comparison, remember the apples and oranges and make sure that you aren’t assuming that two distinctly different entities are the same! This entry was posted in Faculty Blog, Relevance of Humanities, Religion in Culture, Student Blog and tagged apples and oranges, compare and contrast, Comparison, Indian epic, relig, Religion, The Ramayana by Morgan Frick. Bookmark the permalink.